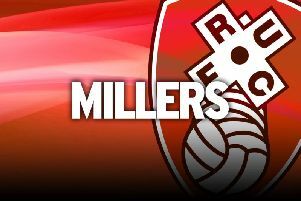 Rotherham assistant manager Richie Barker praised the depleted Millers for picking up a vital three points in their 2-1 win over Preston. The Millers won for the first time since early November thanks to Will Vaulks' unstoppable free-kick and Michael Smith's header. Lukas Nmecha struck one back for Preston but Rotherham clung on to their slender lead through a period of pressure in the final 10 minutes and into injury time. Rotherham staff Warne and Barker had to cobble together a side with Zak Vyner and Clark Robertson missing through injury, Billy Jones and Richie Towell suspended and loanee Ryan Manning recalled by parent side QPR. Barker said: “It was a vital three points and after looking at other results it was even more important. “We had a few square pegs in round holes so we are obviously delighted to get the three points but we are well aware that we need to improve things. Vaulks struck on the brink of half-time with a thunderbolt free-kick to give the Millers a lead they barely deserved after being outplayed for the first half. Only Marek Rodak's impressive goalkeeping stopped Preston from having the game wrapped up. The on-loan goalkeeper saved with his legs from Graham Burke's shot while Tom Barkhuizen fired wide when clear on goal. The Millers were better after the break and Smith's header put them in control before Nmecha made the game nervous. “Will's goal had no relevance on what we were going to talk about at half-time. It was a fantastic goal,” Barker said. “The fact that we were poor for 44 minutes didn't mean that we could tell them they were all great because Will put one in the top corner. “We had to change things at half-time with the shape and the personnel. We are not afraid to do that. “Being out of the bottom three makes the table more enjoyable to look at for two weeks. Rotherham: Rodak, Ajayi, Raggett, Wood, Mattock, Taylor (Newell half time), Palmer (Forde half time), Vaulks, Williams, Wiles, Smith. Unused: Price, Yates, Hinds, Southern-Cooper. Preston: Rudd, Clarke, Storey, Huntington, Hughes (Woods 67), Ledson, Johnson, Barkhuizen, Burke, Gallagher, Nmecha. Unused: Crowe, Fisher, Simpson, Baxter, O'Reilly, Walker. Attendance: 9,077 (1,141 from Preston).